Presents are always something I struggle with. I'm terrible really. I leave everything to the last minute and then can never come up with a good idea in time. With my wife's birthday approaching I decided to do an idea I'd had for ages. For the first time in what seems like a long while I was going to make her a present! This was going to be for the bedroom. 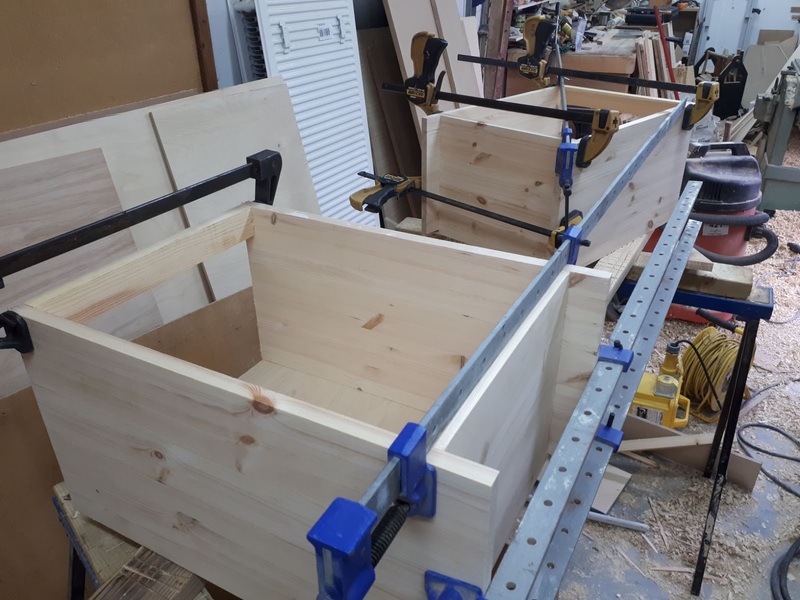 I have already made the bed from scratch, I have also made the carcasses up for the wardrobes (they just need some doors to finish them now). The only thing missing was somewhere to leave an alarm clock and have things by the side of the bed. A bedside unit was in order. But the room isn't huge so only a small unit was needed. The beauty of this meant that the whole thing could pretty much be built from scraps and offcuts. A great way to use them up and a great way to save money. 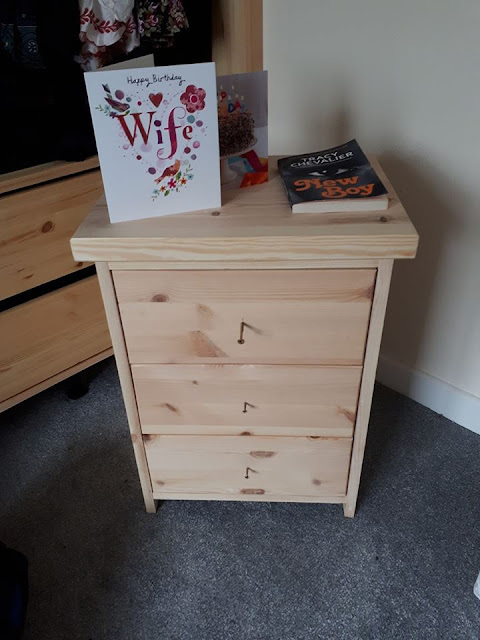 On her birthday morning my wife was really pleased with the unit (and the fact I'd spent very little as we're a on a tight budget at the moment). She was also really pleased that our eldest (7) had managed to remember a book that she had mentioned in passing to her month back, she couldn't remember the name but when we went back to the same bookshop in town she found it pretty much straight away by the cover. 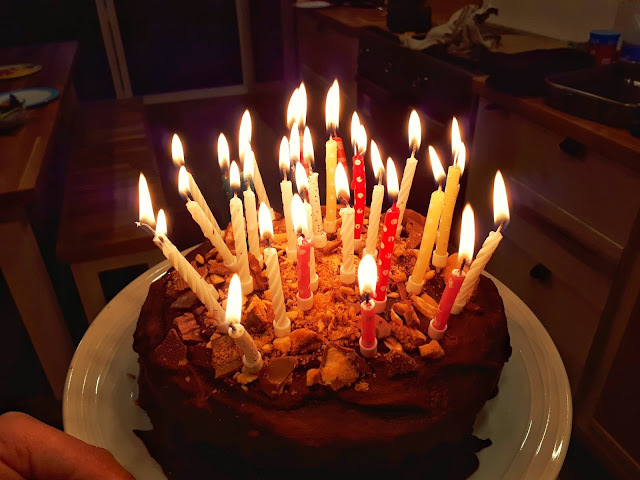 A cake is essential for any birthday in my mind so in the afternoon I got one baked and covered in chocolate! Nearly lost my eyebrows with all the candles and I was still three short! What was the last thing you made for someone? I knitted a pair of socks for my husband for Christmas. I love when my wife knits me something ro does it for someone else, such a lovely gift. My lovely neighbour who is almost a century young asked me to make her two Linton tweed skirts for Christmas. I always prefer to recieve a gift hand made and unique. I usually make up Christmas boxes for friends of marmalades chutneys jams and sauces all home made of course! I really like the gift you made your wife You are very clever to be able to that. Happy Birthday to her. We have done the Christmas hampers in the past, but now the kids eat so much I struggle to keep up with their demands let alone have enough left over! She was pleased with the bedside table so I took that as a win! I make lots of jams and chutneys so most of my friends get some sort of hamper for Christmas. I was really pleased with one I made for my work secret Santa which was a live edge London plane chopping board my son made, gift wrapped with some chutneys and relishes. It looked fab and by chance my recepiwnt has picked my name and had painted a picture of my dog! Having a painted picture back is amazing, I'd never have the confidence to give anyone anything I've made other than wood stuff! I'm the lucky one! No one else would put up with me!